This Ambassador Mansions and Gardens toast included the 19 groomsmen, 18 bridesmaids, and 3 bridesmen that made up the wedding party for this incredibly lucky couple. As a photographer, I'm often presented with access to important events during the wedding day. And this is event is no exception. Moments before the bride and groom were to walk down the hill from Terrace Villa mansion to their wedding ceremony area, someone poured 42 glasses of Champagne. It appeared that everyone was about to start sipping their drinks as they all stood in small groups across the whole first floor. Seeing that I had a photographic opportunity in the making, I suggested a group toast to the bride and she thought it was a great idea. 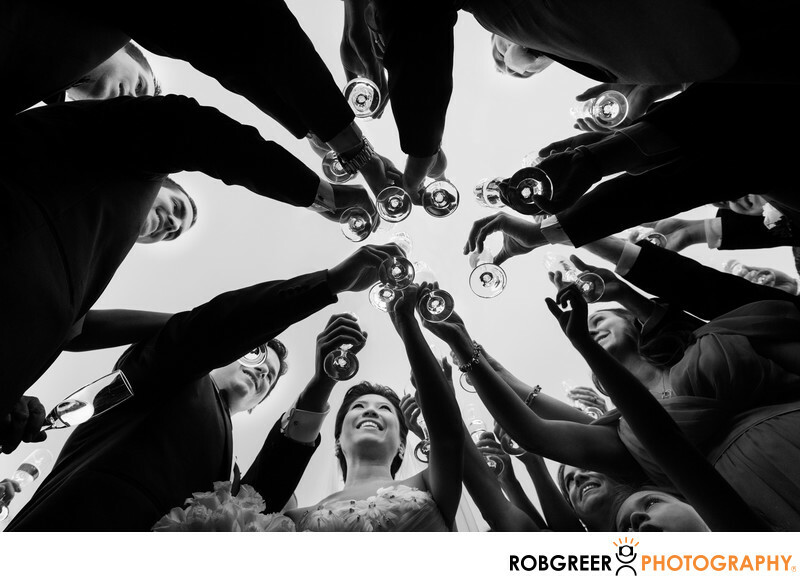 I wanted to create an image that showed the size of their wedding party but that also had a sense of intimacy. I decided to lay on the floor and shoot upwards as their glasses came together. I asked my second photographer to stand on the periphery in order to capture the overall size of the large group. In the original version of this photograph, there is a crystal chandelier on the ceiling. I found it terribly distracting and so I removed it from the image using Adobe Photoshop. Ambassador Mansions and Gardens is located in Pasadena, California. Website: http://ambassadorcampus.com/. Contact Person: Sylvia Noland, (310) 292-5393, sylvianoland@aol.com. Location: 160 S Orange Grove Blvd, Pasadena, CA 91105. 1/80; f/5.0; ISO 1000; 24.0 mm.